I found this interesting pupa under a snake board in a field at Wachusett on Monday. I looked through your book and couldn’t find anything like it. Any ideas? I work for a non-profit in the Palo Alto, CA area and saw the following on a plant in Menlo Park, CA. I can’t tell you what plant it was on, unfortunately, but I can tell you that there were other markings like this one on other leaves of the plant. Is it an insect or bug that made it and do you have any idea what it could have been? Interesting pattern! It’s not immediately recognizable to me… it appears to be something on the leaf surface, but I can’t quite tell from the photo whether it’s something clear and shiny or something white and fuzzy. If the former, all I can think of is some kind of slug/snail, but that seems unlikely given how convoluted the pattern is. If the latter, I’ve seen planthopper nymphs and related insects (e.g. psyllids) leave behind something vaguely similar, but again, not such an intricate pattern. I’d be interested to hear more details or see other examples. She consulted with her organization’s botanist/naturalist, who suggested it was a leaf mine of some sort. If it were a mine, it would pretty much have to be from a moth in the family Gracillariidae, since very shallow mines resembling snail trails are characteristic of that family. But it would be very unusual for a gracillariid mine to be so tightly contorted, and there are a few outlying dots in the periphery of this pattern that make me think it is in fact some kind of whitish substance that has been deposited on the leaf surface. Unfortunately we don’t know what the host plant is, but maybe someone will recognize it from the photo above. The left cocoon in photo 1 and the one in photo 2 is the unknown one and the smaller right cocoon in photo 1 is from Asterodiaspis variolosa . 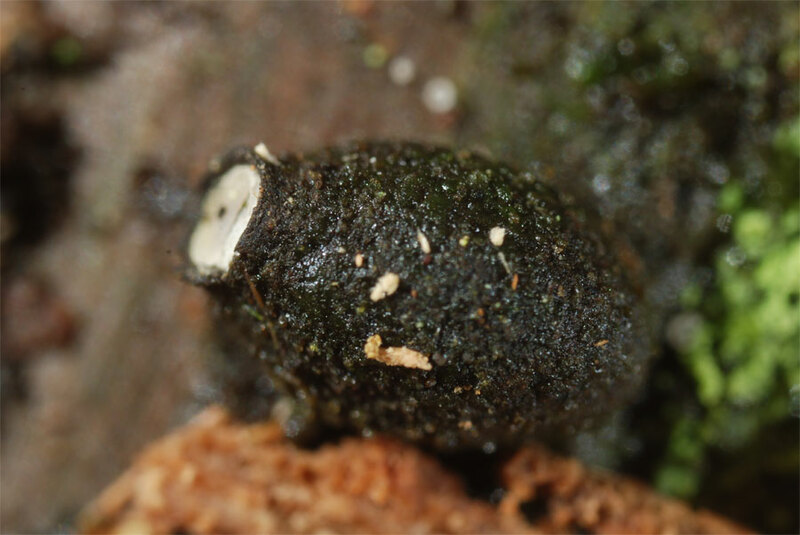 The cocoons are 4mm long and 1.5-2mm wide. The small white cover is the place where the cocoon is opened and left by the inhabitant. …The cocoons can be found in forests (plantations) of Douglas fir, a fir that is not native to Europe but is cultivated for its wood. Here we find the cocoons underneath fallen dead branches in the neighbourhood of Douglas fir. There should be some free air between the place of the cocoon and the soil. I have opened one cocoon in order to see what is inside it and have made a photo with my stereo microscope. This photo gives me the strong impression that we have to do with an insect (see attached photo). 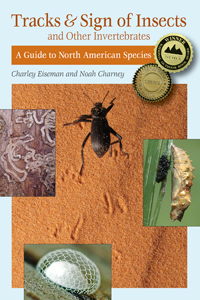 Because the Douglas fir is native in your country this insect is possibly known in the USA? So I hope you can help me in solving this puzzle. Looking at the first two photos, I was going to guess an egg sac of a spider such as Agroeca, but your photo of the opened one makes it clear that it is a cocoon, presumably of a moth. Would it be possible to remove the object (pupa?) from the cocoon and get clearer photos of it? Unfortunately I have never seen something quite like this before. It may or may not be something related to the Douglas-fir; I live on the other side of the country from where Douglas-fir is native, and have only spent a little time exploring the Pacific Northwest. I have no such excuse for not doing anything until now with the photos below that John van der Linden sent me in August 2015. Julia and I had met John a few weeks earlier when we stayed with MJ Hatfield in northeastern Iowa, but John’s photos are of things he found on tree trunks in India. 1. 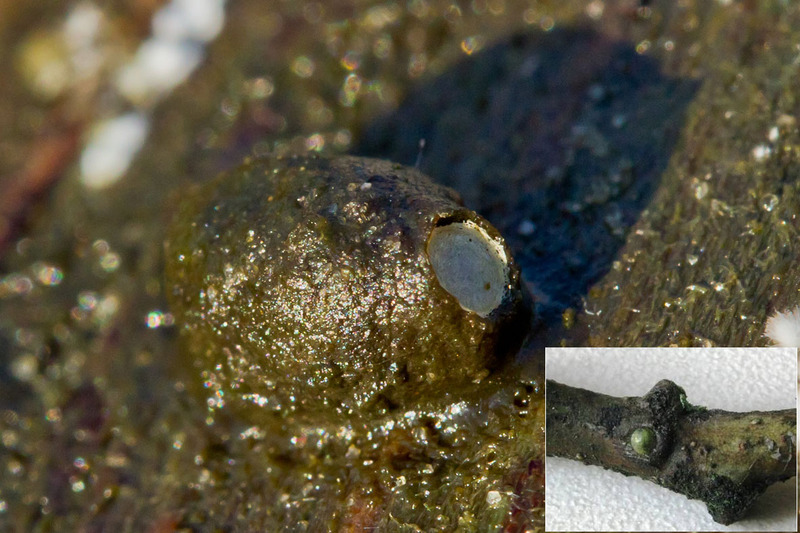 The top image shows a flattened case that has a two-lobed shape. This case was structured like a turtle shell. The visible part is larger in diameter and faces out (the “carapace”). The invisible part is smaller in diameter and touches the bark surface (the “plastron”). The larva hid sandwiched between these two layers. 2. What I called the “cobra case” because it reminded me for some reason of the hood of a cobra. Fascinating architecture (see diagram, next picture). Yes, the case actually had two rows of holes built into it, along its margins!! 3. Diagram of the cobra case. 4. Cobra case stripped down to just the tube part of the case, with larva partly emerged. 5. Another view of the cobra case larva. The head was distinctly flattened into a blunt disc with the approximate inner diameter of the tube part of the case, so that when the larva rested inside the tube its flattened head acted just like a manhole cover, sealing off the tube. 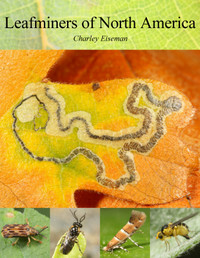 The larva looks like something gelechioid to me, like a Coleophora… somehow the construction of the case is reminding me of Batrachedridae, which includes the octagonal casebearer as well as a species (pictured in my book) that makes a vaguely similar expanding frass shelter on palmetto leaves [here is an example on BugGuide; both of these moths are now placed in the family Pterolonchidae]. I have just found a second example of a mystery I can’t solve. I found the first about 5 years ago in FL. The second was found today in Austin, TX. Size is just under 10 mm if I remember correctly. They seem sort of waxy, and the “tail” is oriented down. I thought about some sort of diptera puparium, or maybe a wasp or bee nest. Anyway, I was wondering if you’ve seen this and know what it is. The shape reminds me of some spider egg sacs, but the material doesn’t seem to make sense for that… The closest thing I can think of is a resin bee nest, but the ones I’ve seen always are packed with pebbles and never have any kind of tail like that. . . I would strongly suggest that you put it in a container and give it a few months to see if something comes out, and if not, then cut it open to see if you can make sense of its contents. In August Valerie wrote back with an update. The insect turned out to be one she knew as an adult—see her photo here. * Steenberg, C. M. 1938: Recherches sur la metamorphose d’un Mycetophile Delopsis aterrima (Zett.) (Diptera, Nematocera). – Kgl. Dansk. Vidensk. Selskab. Biol. Medd. 14: 1-29. This entry was posted in Solved Mysteries, Unsolved Mysteries and tagged Anthidiellum notatum, bee, butterfly, Cercyonis, Cercyonis pegala, chrysalis, common wood nymph, Diptera, Epicypta, fly, fungus gnat, Hymenoptera, Lepidoptera, Megachilidae, Mycetophilidae, Nymphalidae, pupa, resin bee. Bookmark the permalink. The sample from California looks like “webbing” from a spiralling whitefly. It is a fairly recent invader in Florida. Ah–I knew it reminded me of something I’d seen before; I must have been thinking of this. Hi. The second photos look like eggs and nymph of whit fly that adult female deposit her eggs in a spiral line. I was pleased to see Piet Tutelaers’ photos and would be even more pleased to find out what creature that is. I have found similar structures in the southwest of Finland, on the underside of some wood lying on the ground, in a garden in a spruce-dominated Myrtillus-forest. My attempt at rearing also failed. Will try again if I find more! Interesting thought… the cryptocephaline beetles I’m familiar with attach the opening of the case to a substrate when ready to pupate, so you don’t see a white silken “window” like that, but the general shape of the cases seems right.